PIRATES OF PENZANCE - page one. Set Construction - Gary Leitch. Then assembled on the stage by Norman Ballentine, Alan Rankin, Alan McClarty, William Coulter, Harry Stinson and Peter Duffy. On board the Pirate ship. You can probably can tell the back section of the main piece was on a flat and painted tromp l'oeil . 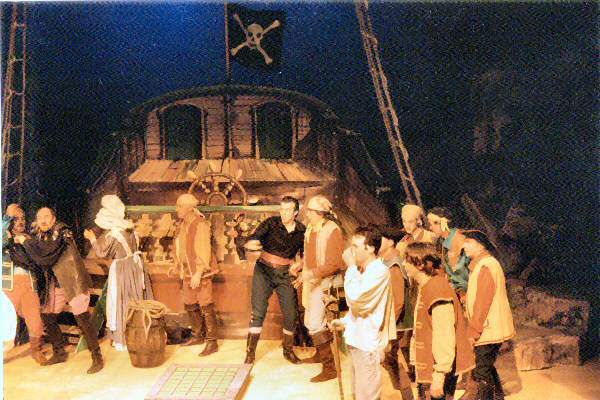 This piece was built around a rostrum on which the cast stood behind the railings and the practical ship's wheel. Everything behind them was painted on the flat.